Stewart Chen, owner and executive chef at Umi, was raised in Kuala Lumpur, Malaysia. He embarked on his culinary adventure when he began his new life in the United States in 1988. With three Bay Area restaurants already under his belt, Chen's entrepreneurial spirit and culinary skills has earned him praise from his guests. Previous to his career as a chef/owner restaurant entrepreneur, Chen gained his culinary experience at various restaurant and hotels. His humble beginning was in 1990 at Suisha, then a very popular Japanese restaurant in Foster City. He was able to learn the entire operational functions of the restaurant from the ground up, starting as a dishwasher. The executive chef of the restaurant taught him how to properly cook and marinate the sushi rice, how to choose the freshest seafood, how to fillet different types of fish, how to intelligently inventory to control freshness, and eventually how to make and prepare sushi and various Japanese style dishes. Chen's strong Japanese cuisine foundation has proven to be an invaluable asset in his road ahead. In 1995, he became the chief sushi chef at the San Francisco Marriott's Kinoko restaurant. Then in 1996, he joined the culinary team at the San Francisco Sheraton Palace Hotel. Hotel exposure and the chances to work with world class acclaimed chefs further enhanced Chen's style toward California fusion. Chen departed the hotel business in 1999 to open his first restaurant, Amberjack Sushi, a 35-seat restaurant in the Noe Valley. At Amberjack, he introduced and fine tuned his California style by layering texture and flavors based on his Japanese and American cuisine experience. 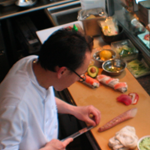 In 2004, he opened a family-style Amberjack Sushi in Mill Valley, California. Recently, Chen, always in tune with the trend, envisioned a modern bistro-style Japanese sushi and sake bar on Union Street. Thus, Skipjack Sushi, was born in 2006, which appealed to both local and visiting sake and sushi lovers. With the birth of his daughter on the way, Chen decided to partner with Russell and Shamus to open Umi in 2008 to help share his emphasis on taste, freshness and artistic presentation. 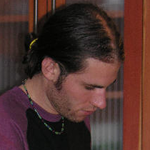 Shamus Booth, owner and general manager at Umi, was raised in Royal Oak, Michigan. Creative and mechanical by nature, he has fixed and built things all of his life. Starting at the age of 14 Shamus worked with his father learning the skills of the trade. Just before turning 20 years old he became a licensed plumbing, heating and mechanical technician for the family business. Soon after, he bought a small house in Ann Arbor and put his energy in to a full remodel. During the next five years he built an addition and completely re-worked the house, giving him the experience he needed to construct anything he could imagine. Then, the west coast started calling, and San Francisco was the destination, so he started his own business and began working on high end construction projects. In 2006 his good friend Stewart Chen needed assistance with renovating a newly purchased restaurant space to execute his vision. Shamus has a natural inclination towards aesthetic simplicity and functional simplicity. This helped Stewart and Shamus create a space that encapsulated the modern style they both were seeking. Towards the end of 2007 Stewart had found a new restaurant, that also needed renovation, and this time called on Shamus to partner with him and use his past experience in restaurant renovation to create another masterpiece. At the beginning of 2008, the new restaurant Umi was opened. Due to the size of the project it was decided the restaurant would be completed in phases, to enable it to open its doors earlier. Shamus also has a passion for music and art, which can be seen and heard in the restaurant. Russell Richardson, owner and adviser at Umi, was raised in Ann Arbor Michigan on an old 20 acre farm that used to be a slaughter house. His mother is an econ professor that since before he was born had a garden filled with fruits and vegetables. He spent many summers hauling manure to the garden for fertilizer, unwillingly picking vegetables to sell at the local farmers market, and happily gorging on radishes and lettuce. His father is a tool and die maker with a hand for cooking steaks and scallops. His grandfather is a PhD physicist that was able to hand over computers to the family, and then accompanied by programming books from his mother, this eventually led to Russell's bachelor degree in computer science from the University of Michigan in 2001. His life was not void of other activities though, he spent 12 years playing the saxophone, practiced Tae Kwon Do for 10 years, and had a brief stint in the musical Oliver while he was in middle school. However, with the degree, it made relocating to San Francisco an easy decision and he quickly began to make his mark in the corporate world of computing. After 4 years of corporate life, and only a faint recollection of his love for math and computers, Russell became restless in his new found life. He started pursuing his old hobbies, including taking classes in theater. He also spent many evenings going out to different restaurants, and consuming the wealth of food San Francisco offers to the world. Eventually an acting role he was working on convinced him that he could quit his corporate job and take things from there. 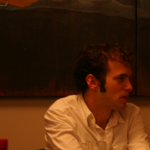 He started doing software consulting work, and after a few months of that Stewart and Shamus approached him to help with the restaurant, and that was the beginning. In the 7th year of being open Russell relocated to Frederick, MD which is where he currently resides and continues to do software consulting and is working in a brewery with hopes of opening his own place one day.